With all the doom and gloom in the world, it seems as though everywhere we turn, there's one crisis or another. And although it's crucial to be well-informed and prepared in these modern times, "consuming" a consistent diet of bad news takes a toll on health, happiness and even our rate of aging. In spite of this, we can apply straightforward action that counteracts the negative effects that we experience. The best part is that it takes only a few minutes a day to radically change our physical and mental well-being, while at the same time slowing -- and possibly reversing -- the aging process. The secret? Living a life of gratitude. As unlikely as it may sound, when we slow down and take the time to appreciate all the good in our lives -- rather than what we are dissatisfied with -- a radical change in our physiology occurs. The simple act of gratitude has been scientifically shown to balance our heart rhythms and nervous system, leading to favorable changes in immunity and hormonal equilibrium, as well as increased production of the anti-aging compound DHEA. Further benefits include a significant reduction in stress, anxiety, insomnia and depression. Considering that the damaging effects of stress contribute to a spectrum of diseases -- including, but not limited to cardiovascular disease, cancer, mental illness and a variety of autoimmune disorders -- it's in our best interest to get a handle on this health-destroying syndrome. The good news is that we can easily tame stress in just a few minutes per day by using simple techniques. A study sponsored by the Institute of HeartMath and the U.S. Naval Postgraduate School in California discovered that a new emotional self-management program significantly reduced the stress hormone cortisol while increasing DHEA, resulting in a remarkable reduction of tension and anxiety. Forty-five healthy participants were involved in the study. Salivary DHEA/DHEAS and cortisol levels were measured and the autonomic nervous system was assessed using a heart rate variability evaluation. A psychological questionnaire was also given. Individuals were evaluated before and four weeks after being trained in the emotional self-management program, which included practices that encourage appreciation and gratitude. "The experimental group experienced significant increases in the positive affect scales of Caring and Vigor and significant decreases in the negative affect scales of Guilt, Hostility, Burnout, Anxiety and Stress Effects, while no significant changes were seen in the comparison group. There was a mean 23 percent reduction in cortisol and a 100 percent increase in DHEA/DHEAS in the experimental group." The full report can be found here [PDF]. Two key techniques were used for the experiment -- the "Cut-Thru" and "Heart Lock-In." To learn the specifics of both practices, see The HeartMath Solution. If you would like to use a few easy methods that encourage balanced heart rhythms, stress reduction and positivity, this page is a good place to start. Additionally, The Appreciative Heart: The Psychophysiology of Positive Emotions and Optimal Functioning is available as a free e-product download. 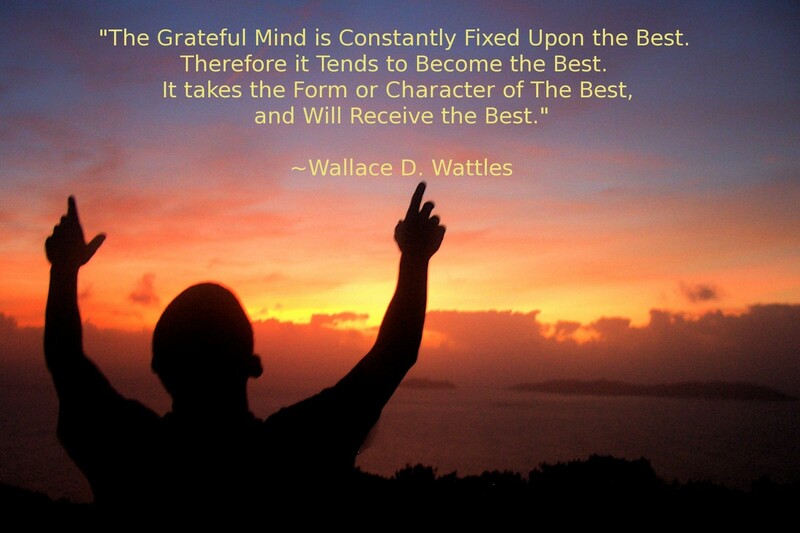 "Gratitude is a simple and effective practice and the benefits are real and attainable. Many of us know this in our hearts, but now it's proven by modern science. Gratitude creates a healthier, happier and more fulfilling state of being for anyone who takes a few moments to feel and reflect on it."